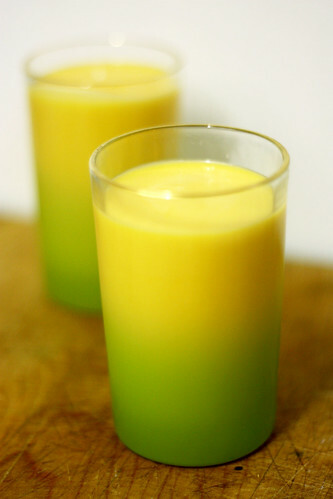 No trip to an Indian restaurant is complete without a delicious mango lassi. So, why not bring this delicious treat home? Lets! I always think mangoes seem like such a luxury. They can be a bit expensive to buy individually and take a bit of time to process, when you have to work around the big pit. I pride myself on doing everything from scratch, but purchasing canned mango pulp from our local Lebanese market is one short cuts I always allow myself. 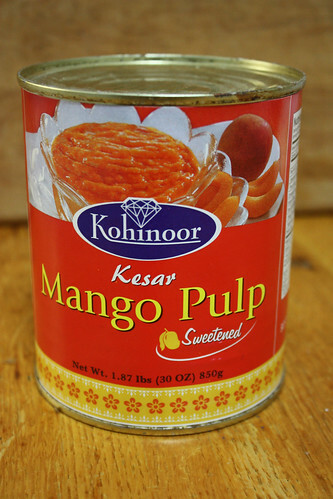 With a can of mango pulp, a mango lassi is but 5 minutes away! 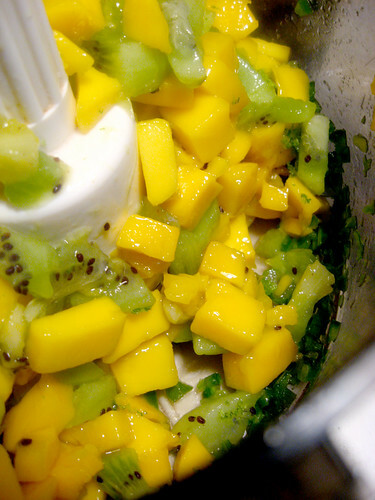 In a blender, mix all ingredients and blend. This is a thick drink, so you can dilute with more milk, or ice chips if you want to chill it a bit. The antidote to too spicy food is diary. If you’re mouth is burning off after biting into a pickled jalapeno, follow it with a chug of milk and you’ll feel better. I love Tres Leche, a sweet moist cake soaked over night in a creamy milk sauce, to follow spicy dishes. We felt this would be a perfect dessert for Chili night, but needed something exiting to go with it to spice it up. I suggested garnishing it with a mango salsa and my sister immediately said make it a sorbet! 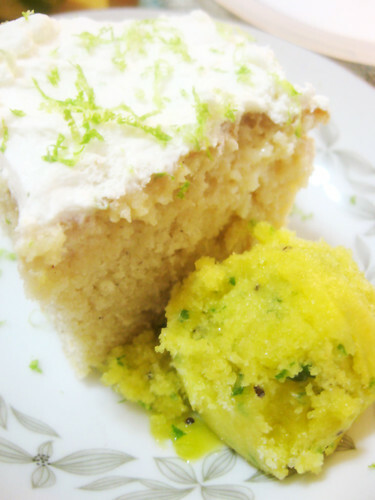 The tart and spicy flavor of the sorbet would go wonderfully with the sweet creamy delicate cake. The simple syrup needed to be chilled before making the sorbet, so I did this first and allowed it to chill for about 2 hours. 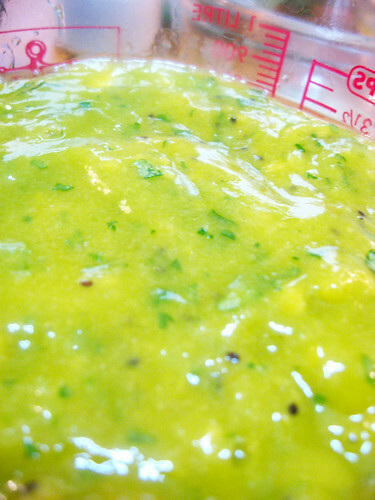 I processed them all in the food processor to form a nice smooth puree. 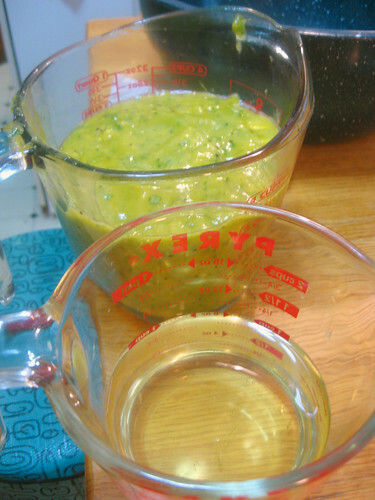 Then, in a ratio of 1:1 I mixed the fruit puree and the simple syrup and poured into the ice cream maker. My sister’s ice cream maker says to mix for 90 minutes. After the 90 minutes, the sorbet was not completely frozen yet. We had four hours before our guests arrived, so we just removed the motor from the ice cream maker and placed the sorbet and machine core into the freezer. We removed it every hour and mixed it with the paddle for a couple of minutes, and by the time of the event, the sorbet was ready to be served with the cake. 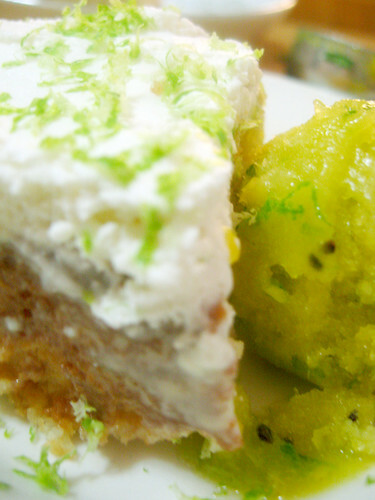 We served the sorbet with the Tres Leche cake and garnished each dish with a shaving of lime zest. 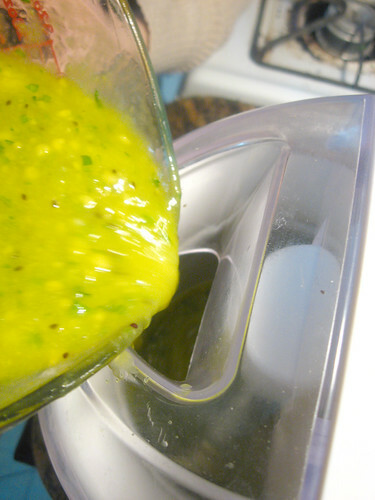 **Notes: My sister and I felt the sorbet had too strong of a cilantro taste, so in the ingredients given above, I have cut the suggested amount in half and suggested only using the leaves, as the stems can have a stronger flavor. Also I linked to a simple syrup recipe which uses a 1:1 ratio of water to sugar which I think might work better. We made our simple syrup with a 2:1 ratio water to sugar and this might have lead to the sorbet not wanting to solidify.